Bioroids and Bombots: Weapons: TS-era Hydra Rockets. The TS-era enjoys considerable advances in computing and miniaturization. Homing projectiles as small as 4mm are relatively common. New compositions of explosives make smaller weapons more powerful. It is inevitable that such technologies be used to upgrade some older, well established weapon systems. 2.75”/70mm rockets such as the current Hydra-70 still see wide-scale use in the TS-era, gaining new capabilities from technological advances. They are generically known as “Hydras”, “2.75s”, “Seventies”, “FFARs”, “seventeen-pounders” etc even though they are now produced by a number of different companies under different brand names. Originally developed as air-to-air weapons the 2.75” Folding Fin Aerial Rockets (FFAR) have mainly been used in a air-to-ground role. Initially very little use of them in a surface-to-surface role was made, most attempts being field improvisations or prototypes. 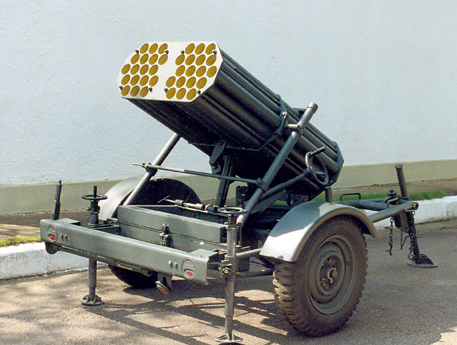 The efforts that were made usually used the rockets in an artillery role as a MBRL system. Eventually it was recognized that these weapons could provide useful additional firepower for light ground vehicles such as APCs. A faster burning motor better suited to shorter range direct fire applications became available. This gave rockets a higher initial velocity and flatter trajectory. In the early 21st century attempts were made to create cost-effective guided/homing versions of the FFARs, usually using semi-active laser homing (SAHL). By the TS-era low cost, effective homing systems become common so by 2100 nearly all FFAR encountered are likely to have seeker heads. The FFAR remains a useful weapon system for targets that do not require heavy weapons like the Jaguar missile but are more than a light cannon, mini-missiles or machine-gun can handle. FFARs are relatively simple weapons so cannot be used in vertical launch systems. They need to be aimed in the direction of the target before launch. For a ground vehicle this usually means some form of turret mount that can be aimed and elevated. Pods of FFARs mounted on the sides of AFV turrets are a commonplace. A number of other weapons are designed to utilize the same launcher systems. Aircraft may use fixed pods and turn towards the target before launch. TS-era FFARs can be considered to have Homing (Infravision) and can also be used in conjunction with a laser designator for the usual bonuses. Warheads weigh 10-17lbs. All Hydra rockets have backblast (HT4e p.147). FFARs need a launcher pod. This is usually either seven-shot or nineteen-shot. Lightweight pods are used on aircraft and UCAVs while armoured pods are used on fighting vehicles. A single-shot tube and a four-shot pod is available for applications where weight is critical such as light UCAVs. These smaller systems can be mounted on a tripod and fired remotely. Indirect fire artillery systems each carry the equivalent of several pods and are commonly mounted on light trailers or vehicles. Weight is for empty launcher/one rocket. Creates 19-yard radius cloud lasting 1 minute. TS-era marker/smoke rockets are designed to be non-lethal. Damage given is for being hit by a rocket that has not detonated. FFARs used for surface-to-surface indirect fire have a minimum range of 765 yards and a maximum range of 16,000. For the fast-burn rocket motor used for direct fire from ground vehicles change velocity to 760yds/sec, minimum range to 30 yards and maximum to 5,000yds. A variety of warheads are available for FFARs. Pods mounted for direct fire on vehicles usually use HEMP along with a few flechette/beehive rounds for use against personnel and flying targets. The Italian-made Firos-6 51mm air to ground rocket is a contemporary of the 2.75” but was less widely used. The use of smaller and lighter UCAVs and concerns about collateral damage were to give the 51mm a new lease of life. A 51mm rocket is half the weight of a 2.75”. 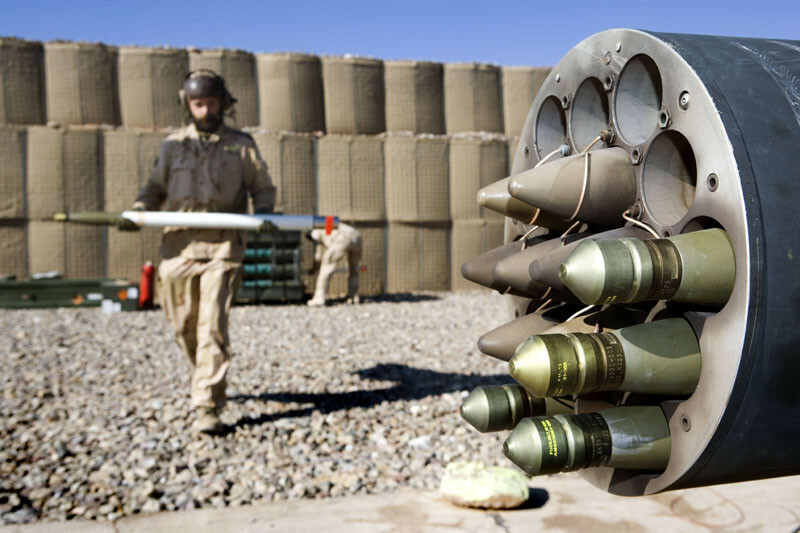 New explosive formulations made the small rockets more powerful and low-cost seeker heads made them more deadly. All Firos rockets have backblast (HT4e p.147). 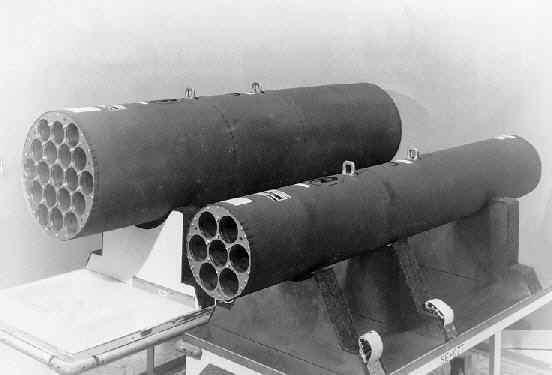 TS-era 51mm rockets weigh 11lb with a 6lb warhead and are 1.05m long. Velocity is 560yd/sec and maximum range is 7,200yds. RoF is 10/sec. TS-era Firos-6 can be considered to have Homing (Infravision) and can also be used in conjunction with a laser designator for the usual bonuses. 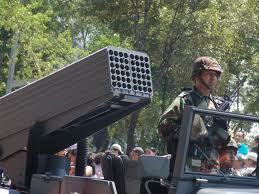 Note: 51mm rockets would be very well suited to a GURPS Car Wars game. Other warheads included HEI, fragmentation, chaff, smoke, marker, illumination and practice. The rocket is large enough to carry several hexes of cyberswarm. Use of TS-era materials may decrease the empty weight. A 48 round launcher suited to mounting on light vehicles was offered as a surface-to-surface MBRL system and purchased by the Mexican marines for mounting on French-built ACMAT (4 × 4) cross-country truck chassis. Range is 7,200yds, Rof=10 and reload time 5 mins. Launcher weight is probably about 150lb.